I woke up in the morning as a first time mom, at age 40. Delirious with peace, that finally, someone chose me as their mother. Chose me to guide them through this lifetime. Celebration was, for sure, in order. Hours later, my world went from delirious to anger, and the deepest sadness I have ever felt. This is not what God was supposed to bring to me. My son having an extra chromosome, was not what I was prepared for. I didn't know how to tell my friends and family, that my son entered the world, disabled, by society's terms. Mentally retarded, by society's terms. Hadn't I already put my time in with karmic debt? Wasn't it time for me to manifest and design a happier state? It's now been over two years since Chase Alexander became my son. I am delirious with peace, that he chose me as his mom. God sure knew it's exactly what I needed. Watching his smile, evokes a daily celebration. He effortlessly illuminates every space he enters, the world as a whole. 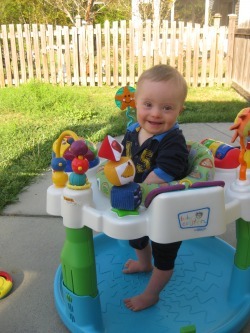 He is more engaged in life, than a lot of people I know, who don't have an extra chromosome. "Patience", Chase says, as he learns the most basic physical processes, with delay. "Embrace everyone", he says, as he pulls every stranger into his heart, to say hello. "I love you mommy", he says, as he reaches his arms in the air, for a hug and kiss. "I will always be o.k., mommy", as he pours me some tea, and makes me cereal, from his make believe serving tray. My enormous lessons through the presence of his soul, has just begun.